Russia Now begins a series about the Soviets in Afghanistan, with an account of a secret mercy mission by a noted Russian journalist. There are important parallels and differences with the present situation involving international forces. In November 1991, five months before the fall of the Najibullah regime, a strange group - two Britons and a Russian - secretly crossed the USSR border into Afghanistan. During Desert Storm, I got to know British TV news cameraman Rory Peck in Baghdad. He had covered the war in Afghanistan, but, unlike myself, he lived in Peshawar, fraternising with the Mujahideen. I was in Kabul; the only Mujahideen I saw were in prison. We became friends and, hiding from American bombs in the basement of the Hotel Al Rashid, we planned a trip to Afghanistan to rescue Soviet soldiers held by Islamic guerrillas. Although our army had returned home, these captives had simply been forgotten. Putting this idea into action was not so easy. We had to get the agreement of President Gorbachev and permission from the KGB to illegally cross the Afghan border. Later, I learnt that when Najibullah found out about our plan to secretly visit the field commander Ahmad Shah Massoud, he flew into a rage and ordered our convoy to be intercepted at any cost. 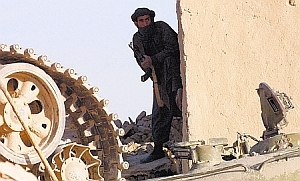 He had decided that the Russians had entered into separate negotiations with Kabul's bitterest enemy behind his back. But this wasn't true: we - Rory Peck, his colleague Peter Jouvenal and I - were looking for the captives. The whole venture was crazy. It was already winter, snow had fallen, and we had to get through a dozen passes up to 5,000 metres high. Part of the route went through areas controlled by people who didn't care whether you were Russian or British - if you were an infidel, they shot you. We could freeze to death in the mountains or fall victim to Islamist fanatics or Najibullah's agents. This long introduction is only so I can recall the passionate arguments Peck and I had during our 30-day journey. My British friend would not let even the slightest opportunity pass to reproach me for the invasion of Afghanistan. It was as if I had been the one who decided to bring in the 40th Army and bomb the local villages. "The Afghans are destined to always have a bad relationship with the Russians," my friend would say with great feeling. "They already know what Communism is. They've already been dying under your bombs." His words did not seem entirely fair. "But perhaps the Afghans will see that the Communist regime and ordinary citizens like me are not the same thing. You cannot always live with hatred in your heart," I argued. "No," Rory would say, "you don't know the Afghans, but I do. These people will never forgive you for losses and destruction. They may have bad clothes, but they have a good memory. Open your eyes and look around." I should note that during that difficult journey, so full of danger, I was not a Russian. Before we arrived at Ahmad Massoud's base in Takhar Province, I was a Finnish correspondent to everyone we met. That was the cover. Rory assured me a Russian would be strung up from a tree on the first day. "Don't utter a word in Russian, don't read a Russian book when people are around, and don't listen to Russian radio broadcasts," Rory kept telling me. "Otherwise, you can take it from me that some fanatic will turn up and cut you into little pieces." Rory Peck covered the first Gulf War and several armed conflicts that followed the dissolution of the Soviet Union. Praise be to Allah, everything turned out very well. Despite some adventures, we got to the headquarters of the Mujahideen leader and I was able to negotiate the release of our soldiers. Soon after, they returned home. And, in early 1992, the three of us set off on a flimsy raft across the Panj River, the border between Afghanistan and its northern neighbours. I still think about the situation. It's a pity Rory Peck did not live to see today. When I visit Afghanistan now, I do so freely, without concealing the fact I'm Russian, and I associate with our former enemies. And do you know what they tell me? "The best president for us would be Dr Najibullah. And your best president was Brezhnev." That's what former guerrillas say. I can't believe my ears. "Stop that, my friends! It was Brezhnev who brought the troops here. Before Najibullah became president, he was head of the secret service and the bitterest enemy of Islamic guerrillas. Have you forgotten?" No, they haven't forgotten anything. They give you a lecture on the fact that they were the unwitting tools of the Americans, who had treacherously lured the Soviets into the country. They tell you the USSR left them with roads, tunnels, factories, colleges, farms, hydro-electric power stations and housing estates, and that the Soviets left almost the whole Afghan economy intact. And what help did the Americans give? Nothing. Yes, Rory, you were wrong back then, 18 years ago. They don't hold a grudge. It's as if they have completely forgotten our carpet bombing, minefields, "mopping-up operations" and looting - in a word, everything that sadly accompanied the implementation of our so-called "international mission". But memories of tunnels we built, flour and kerosene, free study in the USSR, our beautiful girls and our generous hospitality all remain, warming hearts and nourishing dreams. Of course, it's not Brezhnev they idolise, but that former life, which now seems completely happy. They're not dreaming of Communism, but they want to play a real part in their own destiny - the way the Soviet Union once allowed them to. This is a very important point when it comes to understanding the Afghan situation. As for my British friend, he met his death not in the Pamir Mountains but central Moscow, catching a bullet in October 1993 in the middle of an armed uprising. Rory dashed out bravely with his camera to film fighting by the Ostankino TV centre. He was undoubtedly the most courageous front-line cameraman in the business. A special award for freelancers was created in his memory. I have written a book about him, and to this day I very much cherish our friendship. From 1981-1992, Vladimir Snegiryov worked in Afghanistan as a correspondent for the leading Soviet newspapers Pravda, Komsomolskaya Pravda and Trud. He has produced a post-graduate thesis on the subject of the Afghan war and written a number of books and film scripts. He is now working on an extensive study of the role of special forces in Afghanistan's recent history.